I could not decide on where to go caching on Saturday. We loved the long walk round the Chiltern Hundred last weekend so thought something similar would be perfect as we could not see anywhere closer on the map jumping out saying “find me”. The UK Mega series was the obvious choice: we’d done the northern loop earlier in the year so had the choice of the southern loop or the new Mega Series 2 loop. We opted for the latter with the idea that we would pick off a few caches from the southern loop if we had time too. I was also anxious to go and bag the Chiltern Hundred Bonus cache while I was down south. It’s not exactly close to the UK Mega series, but it would be about as close as I’m planning to be for a while! Isaac was doing things at school this weekend so it was just me on my own. I decided to stop overnight just outside Basingstoke on Friday night so I could get an early start on Saturday morning. This in turn would hopefully give me time to get up to Chesham for the Chiltern Hundred Bonus and then back home for a reasonable time on Saturday night. The hotel was a bit of nightmare as the promised WiFi did not seem to be working and there was no 3G coverage so my 3G dongle refused to work. Luckily I was not there too long so just had to do without internet access for a while. I read a book instead! Saturday morning dawned and it looked a promising day with clear skies and the sun shining. I drove to Bentworth to start the trail. I’d read that the last cache of the series – #057 – was opposite a pub and a bit of a nightmare to look for later in the day when people were sat outside the pub. Luckily I found a handy parking spot right next to the cache so did that one first. I then got my bike out of the Jeep and set off round the trail, doing them in the right order for a change. I was debating if the bike was a good idea but most of the series looked bikeable on Google Earth and another cacher who had done the series confirmed it should be ok.
A few stiles to navigate at the start of the trail, but not a problem as it was easy to lift my bike over them. At around #012 I bumped into a guy from the local hunt, who was driving round the fields in his 4×4 checking for hazards in advance of the hunt on Sunday. I stopped chatting to him about the countryside and ancient Byway’s for quite some time :-). I bumped into a group of middle aged bikers on a Byway around cache #20. They stopped for a chat and were telling me about part of the Byway being downgraded to a Restricted Byway by the council. I guess this was the part that a cacher fell foul of the law on when he got his vehicle stuck in mud there. Mud, mud and more glorious mud. I suspect it must have rained for the last week around here as the whole walk was seriously muddy. My feet were sliding all over the place but it all added to the fun. I did not even bother trying cache #051 as it was in some roots on the side of an old quarry and very dangerous to get to. If I’d had a rope and someone with me I’d have given it a go, but on my own I did not want to risk it. All too soon I was back at the Jeep and had made good time. The whole series took just under 6 hours to complete. I decided to do a few quick ones from the southern loop that were near the village before heading off to Chesham and the Chiltern Hundred Bonus cache. After I’d done the quick caches in the village, I headed off towards the M3. On the way I did a couple of quick caches that I spotted on TomTom as I drove past: one called Panda Stone and a quick Motorway Mayhem at J5 of the M3. After a long trip up the M3, round the M25 (surprisingly quiet today which was good) and then through Chorleywood, I arrived in Chesham just as it had gone dark. I’d plotted the Bonus cache on my GPSr and noted a few ways to get to it. My favoured route went through a farmyard so I ruled that out as it was dark and I did not want to get arrested loitering around a farm with a torch in the dark. Plan B was called for and involved parking up on a quiet lane, away from houses and then walking over the fields past some caches we did last week to the bonus cache. Off I set, accompanied by the sounds of fireworks going off in the distance. As I entered the woods, my torch started a lot of birds who were settling in the upper branches for the night and they all took flight. The co-ords were bang on thankfully and lead me to an obvious cachers trail, which then took me in for an easy find. Boy am I glad to get this one ticked off after the disaster at the end of last weekend’s trip! I then got settled into the Jeep for the long drive northbound to home. I ended up back home just after 8pm which was not bad at all. 64 finds for the day which is also not too shabby :-). We’ve been meaning to take the long trip down to Chesham to do the Chiltern Hundred series for ages now and as it was school holidays and we had a couple of days spare, we thought we’d finally get round to doing it. The weather looked ok-ish on Saturday but not so good on Sunday so we decided to try and do as much of the series on Saturday as we could. Ideally we’d have liked to do the whole lot in one go but with the winter evenings we were not too keen on the possibility of walking through cattle fields in the dark. We thus settled on a plan of driving down Friday night and then staying at the Premier Inn (Isaac liked the look of it from those Lenny Henry adverts on TV) at Hemel Hempstead West on Friday and Saturday nights. The drive down was uneventful and we picked off a quick drive-by right outside the hotel, which was handy. On the way we went round this ridiculous roundabout in Hemel Hempstead that has smaller orbiting roundabouts around a main middle section. Very un-nerving if you are not expecting it as some traffic is effectively going the wrong way round the middle roundabout! Saturday morning dawned to light rain so we had a hearty breakfast, put on our waterproofs and set off for Chesham town centre. 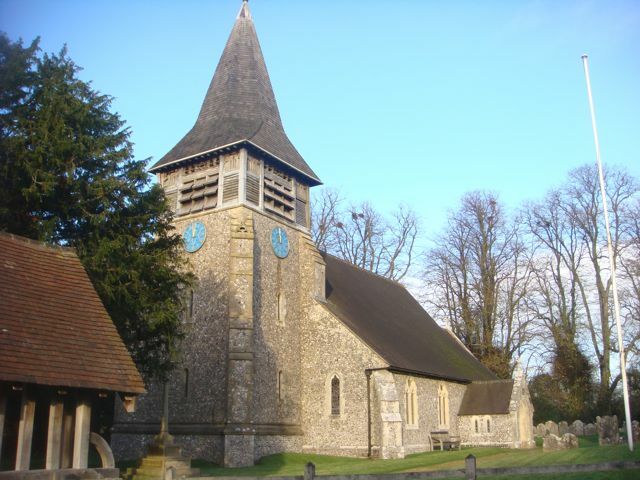 The Chiltern Hundred is arranged in 3 separate loops – the Chesham, Chartridge and Asheridge rings. These all touch at various points so you can easily swap out to another ring as you see fit. Our plan was to start on the Chesham ring doing them in sequence and then near the end, swap over to the Chartridge ring before returning to the Chesham ring going back to the start point. Then, if time and light were on our side, we’d drive to a handy spot by the Asheridge ring and do that as well. Cache #001 had the GPSr’s pointing to the back of some buildings in an area that was obviously private. We did not want to look there so had a scout around the rest of the car park in case the co-ords were dodgy but no cache was to be found anywhere. We decided to leave it and look again on the way back to the Jeep. Cache #002 also had dodgy co-ords as they zero’d out at the back of some fences and we could not find it. In a last ditch attempt we spread the search out and had an easy find of the cache by a bridge. It was only then that we noticed the cache had the word ‘bridge’ in it’s name – doh! After that it was all plain sailing and we walked round the ring having really easy finds on just about every cache, with quite a few of them being on plain view as we walked up (I’m told by the cache owner that this is intentional as they rarely get noticed by muggles). A very different hiding style than we are used to, but fun nonetheless :-). Part way round there was a cache by an ostrich farm which we really liked. We stood for a few moments watching the ostriches and chatting about what odd looking creatures they are. A few caches later we did one with a really good hide. I won’t say too much here as I don’t want to spoil it for others but it’s a very sneaky alternative to what is now quite a common hide. Really enjoyed finding that one. We had a DNF on #033 – the clue said ‘hexatrunk’ and we much have searched every 6 trunked tree near to GZ (and there were quite a few!). Either the co-ords are even further off than we thought, we’re rubbish cachers and missed something obvious or the cache is not there. We’ve got it on our watchlist to see which one is the correct answer (I suspect the middle one!). 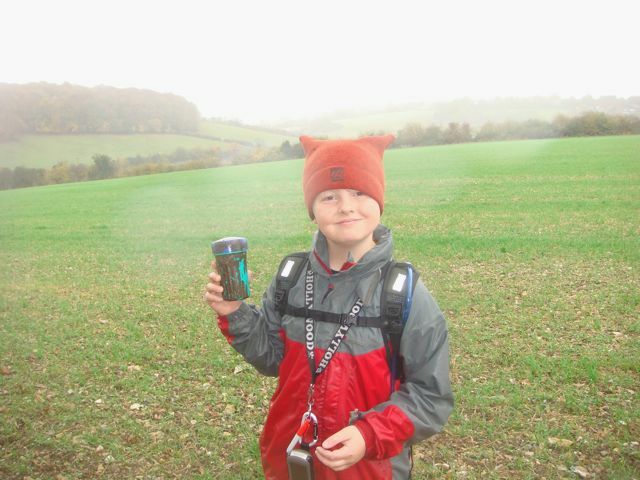 Isaac managed to leave his walking pole at #040 but we did not realise until a few caches later and did not have time to go back for it. Luckily it was not an expensive one, so not a great problem. I’ve noted this in our log for the cache in case the next cacher to do that one finds it. After #042 we spotted a quick way down onto the road, which meant we could swap over to the Chartridge loop and then pick up the Chesham ring later on. The first half of the Chartridge loop took us along a quiet lane and none of the caches were any problem apart from the last one which was well and truly pushed into a hollow elderflower branch. Luckily there was a small hole the other end of the hollow bit so we used a thin stick to slide the cache out. Then it was up onto the fields, round past the local school and back into some woods and another rural section. Nothing much to note here apart from just about every cache being up a tree. I wonder if the cache setter used to like climbing trees as a child ;-)? All too soon we were re-joining the Chesham loop for the walk back into town and the Jeep. It was getting very dark by now and we were umm’ing and ahh’ing about doing the third loop in the dark. Two DNF’s in quick succession (The first was almost certainly there but we spooked a lone female dog walker in the bushes so moved on. The second we think is missing as the hiding place was very public) sealed out fate and we decided to do the third ring in the morning and treat ourselves to a meal in a nice restaurant instead this evening. The last couple of caches into town were easy enough. We looked for #001 on the way to the Jeep but drew a blank again. Once back to the Jeep, Isaac took us back to the hotel to get washed and changed, via a couple of quick drive-by’s. All very easy and no problem at all. Sunday morning dawned as expected with really heavy rain, high winds and low clouds. We had no option but to don waterproofs and go out and get on with the caches as we had to be home early as Isaac needs to get ready for school tomorrow. We started off back at Chesham Station and cache #001. I’d spoken to a previous finder overnight and knew the rough area the cache was in. As we walked up, it was literally sat there in plain view and not hidden at all. It definitely was not there yesterday so all we can assume is someone is interfering with the cache or perhaps it’s slipped under the fence (which is right by it) and the house owner noticed it and pushed it back overnight. All very odd, but at least we found it! A DNF at #059. The hint said it was up another tree but we could not spot it, despite having a good look. In the end we stopped having fun as the rain was awful and moved on to the next cache. A tricky find at #050 right by the cache owner’s house. I hope they were not watching us as it took us an age to find as the GPSr’s were trying to tell us it was on the other side of the lane, where there was lots of ivy to search. In the end we had a re-think, checked a hiding place similar to one we did yesterday and there the cache was! A very nice hide. A few more caches that were made really tricky by all the leaf litter that is around this time of year. A DNF at #076. The weather was appalling at this one and the hint ambiguous. We had a brief look but gave up and headed for the relative shelter of the nearby woods and the next cache. The rain finally stopping around cache #075 with the sun even threatening to come out soon afterwards. We were soon back at the Jeep and that’s where the fun really started. We’d taken photos of all the numbers from the caches as you need 100 numbers to get the co-ords to the bonus cache. Some of the photos were blurred by rain on the lens of the camera and not readable. We were gutted to see we were short of the 100 required numbers. Aaaarrrrrgggggghhhhh! We tried a PAF who very thankfully had the co-ords for the bonus cache (phew!) and off we set. We soon arrived at GZ and despite a good look around could not spot a hint item anywhere within 300ft of GZ. We did find a blue string hanging from a branch at the co-ords and realised we must have been given the co-ords of where the cache was, before it was moved on 4th May this year. We tried two more PAF’s and one was at work without access to their notes of the co-ords, the other was out caching and obviously without access to their computer. The last PAF did provide a rough description of the area the final cache was in and after looking at Memory Map, we suspected it was in a certain area of woodland we could see. Time was running short now as we’d already wasted tons of time looking for the bonus and did not have the time for a brute search of the woodland, even though we were confident we’d find the cache if it was there. Reluctantly we left for home and decided we’d have to grab the bonus cache the next time we are in the area. We’ve not idea when this might be as it’s a long way from home and there are not enough other caches round here to bring us back anytime soon. All in all a really excellent weekend of caching though which we both loved. 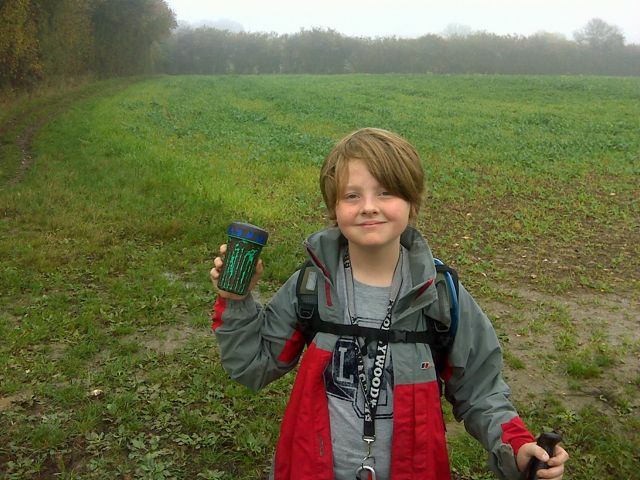 We found 108 caches and DNF’d 6, which is not bad at all. According to the other logs, we’d walked around 24.5 miles in total. The walks were in some great rolling countryside and there was a decent variety of hides to keep the caching interest up.